Art Review: Lucinda Mason, “Macro-Micro, Immeasurable Space and Higgs Boson Particles,” Supreme Court Lobby, Montpelier. Through May 1. Before her untimely death two years ago, at the age of 32, Lucinda Mason had already embarked on a successful career in the visual arts. She had earned an MFA from Concordia University, completed an artist residency at the Burlington City Arts Firehouse Gallery, and was represented by galleries in Toronto and Manhattan. Her current posthumous exhibit, “Macro-Micro, Immeasurable Space and Higgs Boson Particles,” at the Supreme Court Lobby in Montpelier, is a triumphant retrospective of Mason’s monumental final series of paintings, titled “Superconducting Supercollider Suite.” The images are exuberant, energetic and somewhat mystical as they examine both macro- and microcosms of particle physics. A pseudoscience movement in contemporary visual art marries images based on scientific discovery with conceptual narratives interpreting such wonders through less technical eyes. MIT’s visual-art program is even devoting a course to the topic this semester, examining “a variety of contemporary artists who use scientific symbols and language in the creation of their artworks.” Viewed in this context, Mason’s “Superconducting Supercollider Suite” is on the art world’s cutting edge. The series is primarily based on images taken at the Fermi Lab particle accelerator. The looping strings of light first captured by cloud-chamber images from the 1920s also appear. The massive 11-foot-long diptych “Inside the Accelerator” is brimming with loops, dots of various sizes and cloudy patches of color that gallop over black backgrounds on both panels. Pale blue ropes, lavender dots, clusters of yellow speckles and various repeated crescent shapes also crowd onto the surfaces. The bright hues that starkly contrast with the fathomless onyx spaces of Mason’s picture planes are hallmarks of many of her works. The painting titled “03” uses a brighter palette and a white background. Thousands of dots and clouds of stain-painted light-blue mist, juxtaposed with complementary orange areas, demonstrate Mason’s skill as a colorist. Her paint handling is more atmospheric in the lighter tonalities of “03,” as well as in her other nonblack scientific paintings. The show includes a couple of immature paintings from Mason’s “Forgotten Icons Series” that suggest how ardently she searched for a direction before finding inspiration in physics. One of the pieces is a large blue tricycle on a blue background, more loosely painted than her later works. The other is a snail-like, pop-cartoonish character that is so saccharin it’s rather ugly. But there are hints of Mason’s future direction in the character piece — the trendy hot orange and pale blue harmony, and stringy lines that would be used to better effect in later works. 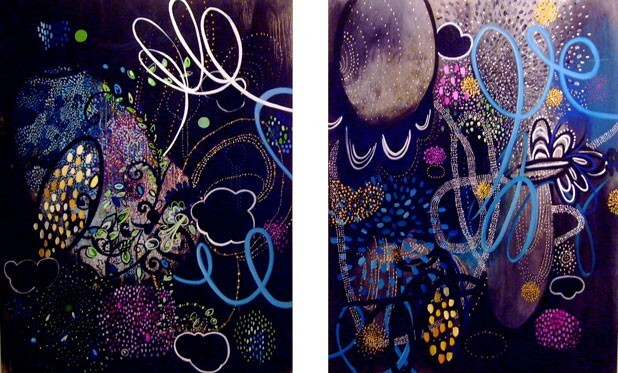 “Neutrinos in the Garden” is a playful, black-backgrounded work with cartoonish, cloud-like shapes and green leaf forms. With what now reads as painful irony, Mason began a 2007 statement about the “Superconducting Supercollider Suite” with the words, “This large-scale painting project is at a very starting point.” That starting point was the beginning of a legacy, as well as the first creative rush in a promising series. Unfortunately, Mason didn’t have enough time to grow tired of it.